Endothelial dysfunction is one of the earliest stages of cardiovascular disease. The root and advancement of vascular disease is profoundly related to the health of the inner arterial wall. Endothelial cells line the inner walls of arteries and act as a protective barrier preventing toxic, blood-borne substances from penetrating the blood vessel. During endothelial dysfunction, the functionality of the endothelial cells lining blood vessels and arteries shift toward a proinflammatory state, and exhibit reduced vasodilation and prothrombic properties. Endothelial dysfunction is widely regarded by the medical community as the most important junction between potential risk and subsequent cardiovascular disease. Research shows that endothelial dysfunction is underlying most forms of cardiovascular disease including hypertension, coronary artery disease, chronic heart failure, peripheral artery disease, diabetes, and chronic renal failure. If endothelial dysfunction is left to continue, the arterial walls gradually begin to lose their elasticity and become thickened and hard. The stiffening of arteries reduces the supply of nutrient- and oxygen-rich blood to the tissues, including the heart. While atherosclerotic plaque is irreversible, endothelial dysfunction is treatable and correction of the condition may be associated with reduced cardiovascular risk. The BioScan Endothelial System allows doctors to identify, measure then monitor endothelial function. This enables specialists to isolate pathological cases of endothelial dysfunction at the earliest stages thereby facilitating timely detection and treatment. Peripheral Arterial Tone (PAT) is a proprietary technology designed to measure changes in arterial tone in peripheral arterial beds. The PAT signal is recorded using a fingertip monitor that measures arterial pulsatile volume changes. This information provides a window into the cardiovascular and autonomic nervous system. The noninvasive Endothelial System supports a pair of modified plethysmographic bio-sensors based on PAT assessment technology. This state-of-the-art method prevents distal venous blood pooling which can lead to a veno-arteriolar vasoconstriction reflex. 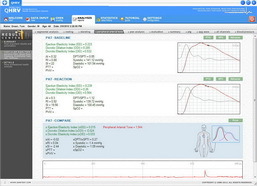 PAT (Peripheral Arterial Tone) technology measures arterial tone changes in peripheral arterial beds. This information collected gives specialists important insight into the autonomic nervous system as well as the cardiovascular system. PAT technology is a noninvasive measure that is currently used to detect heart disease, erectile dysfunction and obstructive sleep apnea, however, it has also proven highly effective in the detection and monitoring of other cardiovascular conditions. As PAT data imparts early-stage information, PAT technology is highly valuable in disease detection and follow-up, thereby improving patient treatment and healthcare costs. 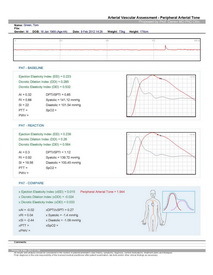 In addition to detecting cardiovascular disease, the PAT system also presents potential for improving the diagnosis and management of other medical conditions including metabolic syndrome, diabetes, peripheral arterial disease and many others. 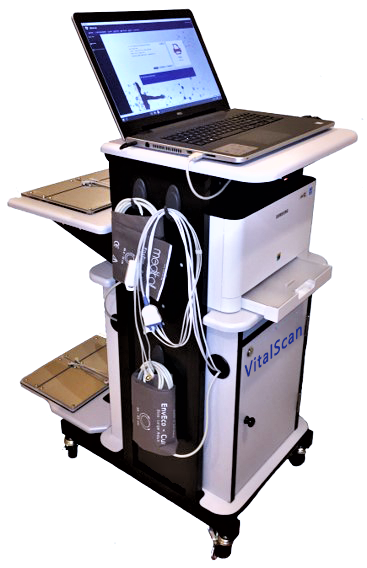 The BioScan Endothelial System utilizes PAT technology to measure endothelium-mediated changes in vascular tone. PAT technology uses a simple and noninvasive finger probe or biosensor. The fingertip biosensor non-invasively measures finger arterial pulsatile volume changes by collecting the PAT signal. The fingertip biosensors apply a consistent sub-diastolic pressure to the fingertip. This manner of probing the fingertip relieves arterial wall tension which produces a greater dynamic range of PAT signal, prevents distal venous blood pooling and prevents the biosensor from shifting or releasing from the finger. Next, a standard blood pressure cuff is placed onto the patient’s non-dominant arm. To control for simultaneous non-endothelial dependent changes in vascular tone, measurements are also taken from the contra-lateral arm. As the cuff tightens, it induces a downstream hyperemic response, which causes a 5-minute arterial occlusion. Once the cuff is removed, the sudden flood of blood causes an endothelium-dependent Flow Mediated Dilatation (FMD). This dilation (Reactive Hyperemia) is marked by an increase in the PAT Signal amplitude. This fluctuation is captured and processed by the Endothelial System. This low reading indicates a correspondingly low risk for heart disease. The endothelium is functioning properly, offering maximum protection and maintaining a healthy heart. This levels is referred to as GREEN LEVEL PAT. This moderate reading indicates that some lifestyle changes may be necessary. The endothelial function is acceptable and there are no current health risks, however, preventative steps may be necessary to prevent endothelial dysfunction and descending into the Red Level. Lifestyle changes such as reducing cholesterol, managing stress, quitting smoking, lowering blood pressure and losing weight may be recommended to avoid or postpone heart disease. This PAT reading is referred to as YELLOW LEVEL PAT. A reading of 1.67 or below indicates the need for urgent medical attention. This measure is referred to as RED LEVEL PAT. Every vein and artery is lined with a thin layer of protective cells called the endothelium. The endothelium is designed to defend vessels from blood-borne pollutants, toxins, microbes and other elements that may cause damage if allowed to penetrate the vascular walls. The endothelium employs an inflammatory defense mechanism, however, over time and with exposure to risk elements, the endothelium’s ability to defend against irritation may be depleted. During damage, white blood cells travel to the site and these along with low-density lipoprotein (LDL) cholesterol enter the artery. Prolonged exposure to smoking, fatty foods, salt, lack of exercise and other factors reduce the ability of the endothelium to protect causing endothelial dysfunction. During endothelial dysfunction, endothelial cells lining blood vessels and arteries shift in their activity toward a proinflammatory state. Additionally, the endothelial cells demonstrate reduced vasodilation and prothrombic properties. If endothelium stressors are allowed to persist, the walls of the arteries begin to lose their elasticity and become hard and thick. This reduces the supply of nutrient- and oxygen-rich blood to the tissues, including the heart. Over a prolonged period of exposure, arteries accumulate high levels of plaque which causes them to stiffen and narrow. This occlusion leads to high blood pressure and may eventually cause heart attack and stroke. If allowed to persist unabated, endothelial dysfunction may eventually lead to serious damage to blood vessels and arteries. Endothelial dysfunction is widely regarded by the medical community as the most important junction between potential risk and subsequent cardiovascular disease. It is also the earliest-stage indicator of cardiovascular disease. The presence and severity of endothelial dysfunction in the coronary circulation has been shown to have important prognostic value for cardiovascular events in people at early stages of disease, beyond any conventional risk factors. Since endothelial dysfunction often precedes the physical presence of serious health issues (in particular, atherolsclerosis) proper and timely assessment and treatment of the condition is vitally important. The Arterial Vascular Assessment provides insight into endothelial functioning and detects structural changes to vessels that are not yet observable using other methods like ultrasound or angiography. Thus, the Arterial Vascular Assessment allows patient and doctor to the best course of action for treatment whether that aggressive lifestyle changes or beginning medication therapy to reduce the risk of a heart attack or health related problems. Atherosclerosis is a disease wherein plaque has built up along the interior lining of arteries. The plaque hardens and narrows the arteries, limiting blood flow and increasing risk of heart attack, stroke and death. It is now widely accepted that atherosclerosis is caused when endothelial cells lining blood vessels and arteries become dysfunctional due to plaque buildup. In addition, it is now known that the same risk factors that cause endothelial damage (i.e. high blood pressure, fatty foods, lack of exercise, etc.) also cause endothelial dysfunction. There is mounting evidence to suggest to cardiac researchers that endothelial dysfunction is a distinct disease on its own. Studies suggest that contrary to popular belief, endothelial dysfunction is the root cause of heart vessel damage and not, as is widely recognized, atherosclerosis. While endothelial dysfunction is caused by an inflammatory response to endothelial damage (caused by exposure to toxins, pollutants, etc. ), atherosclerosis simply a physical manifestation of that dysfunction. Subsequent plaque buildup, arterial blockages and heart attacks caused by endothelial dysfunction present compelling evidence for regarding heart disease and blood vessels in a new way. Therefore, detection and treatment of heart disease begins with the intimate understanding of endothelial cells lining blood vessels and arteries.